Moses commissions Joshua before God's presence. The Assumption of Moses describes two or more Jewish apocryphal works. The best known of these portrays the last prophecies of Moses, given to Joshua just before Moses' death. It is known from a single sixth-century manuscript discovered in Milan in 1861. Also called the Testament of Moses, this work begins with a brief outline of Jewish history up until the first century C.E., with particular emphasis on the Hasmonean dynasty, whose leaders it indicts for priestly corruption. 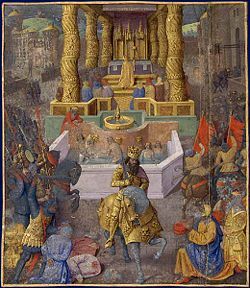 It portrays the tyrannical reign of Herod the Great and his sons as the result of God's wrath due to the sins of the Hasmonean rulers and their Sadducean priests. Finally, it predicts a terrible persecution by the Romans and the coming of a Levite man named Taxo who seals himself and his sons in a cave to die rather than sin through forced apostasy. This act sparks the coming of God's kingdom through the coming of the Messiah. 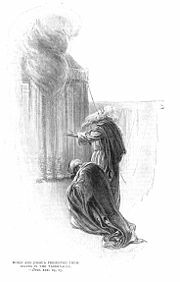 The text concludes with a depiction of Moses' final moments with Joshua. Most scholars date the work to the early first century C.E. Its title was assigned on the fact that one line of the text (1:14) matches a quotation from an otherwise lost Assumption of Moses cited by Pope Gelasius I. A problem posed by this identification is that both Gelasius and Origen refer to an incident in their Assumption of Moses that does not appear in this text, namely a famous dispute between the archangel Michael and Satan over the body of Moses, which is quoted in the Epistle of Jude 1:9 in the New Testament. 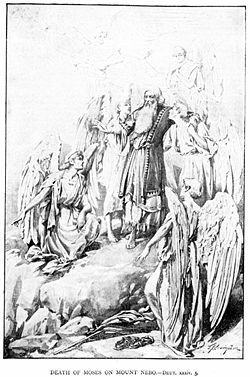 The issue is further complicated by the existence of another fragmentary Assumption of Moses, preserved by the eleventh-century Rabbi Moses ha-Darshan, which describes a visit by Moses to heaven. In this work, Moses returns to earth and is pursued by the angel of death, to whom he refuses to submit but then surrenders his soul gladly to God. The Assumption of Moses was discovered by Antonio Ceriani in the Biblioteca Ambrosiana of Milan in 1861. Based on the literal translation of idioms within the text, it is generally accepted that the extant Latin version is a translation from Greek, with the Greek itself probably a translation from Hebrew. The text is missing several sections, which allowed Ceriani to account for the fact that it contains no mention of Moses' actual death or ascension, and is also missing the famous passage (Jude 1:9) quoted in early Christian texts. Herod the Great enters Jerusalem, seen by the author of the Assumption of Moses as an act of divine retribution for the sins of the Sadducees. The text itself begins with words, "The Testament of Moses," by which the work is also sometimes known. The ninth-century Stichometry of Nicephorus and some other ancient lists refer to both a Testament of Moses and an Assumption of Moses, apparently as separate texts. Thus, the question arises as to whether the current text is actually the Testament, while the Assumption preserved by Rabbi Moses ha-Darshan (below) is the "real" Assumption. The current Assumption of Moses adopts a harshly critical attitude toward the Hasmonean dynasty that ruled the Jewish kingdom of Judaea on the foundation of the Maccabean revolt in the mid-second century B.C.E. The writer is also critical of the more ancient priesthood, which he accuses of idolatry for creating graven images in the Temple of Jerusalem. The brunt of his attack, however, is aimed at the Sadducean priests of the first century B.C.E. during the Hasmonian period under Roman over-lordship, whose luxurious ways and Hellenized tradition he found intolerable. The advent of the evil King Herod the Great is the result of divine punishment for the sins of these corrupt priests. The book predicts that true religion will next be persecuted by a powerful Roman tyrant, who forces the Jews to defile the temple and mutilate their sons' bodies by an operation intended to reverse circumcision. A man of the tribe of Levi named Taxo will then arise and, in an act of extreme defiance, will seal himself with his sons in a cave rather than allow his family to sin. God will avenge them, the author predicts, and then the kingdom of God shall be established under the reign of the Messiah. Since the Essenes were known to harbor a particular animosity to the Temple priesthood at the time in question, an Essene writer is often considered the most likely candidate as the author of the Assumption of Moses. However, the Pharisees were also sometimes bitter opponents of the Sadducees, and thus a Pharisaic author is also plausible. Finally, the Zealots should be mentioned as a third group, possibly overlapping the other two, who favored dramatic action against the Romans and their Jewish collaborators. The text opens with Moses, at the age of 120, summoning Joshua and commissioning him to lead the Israelites into the Promised Land. In a passage echoing Philo of Alexandria, Moses explains that God has "prepared me before the foundation of the world, that I should be the mediator of His covenant. And now I declare unto you that the time of the years of my life is fulfilled and I am passing away to sleep with my fathers." In order that Joshua properly preserve the tradition of the Torah, Moses provides Joshua with the following written prophecies. He predicts that Joshua will lead the Israelites into Canaan, and commands him to "appoint them local magistrates according to the good pleasure of their Lord in judgment and righteousness." After this, they will be ruled by kings. Two "holy tribes" will be established centering on "the tower of his sanctuary," while ten other tribes will break away and "establish kingdoms for themselves according to their own ordinances." Both the breakaway tribes and the two holy tribes will engage in idolatry, and "in the house of the Lord they shall work impiety and engrave every form of beast, even many abominations." A "king from the east," probably Nebuchadnezzar II of Babylon, will then invade, carry away the holy vessels of the Temple, and force "all the people" into captivity. This will include both the two holy tribes and the ten other tribes (who are apparently not "lost" in this narrative). "Then they shall remember me, saying, in that day, tribe unto tribe and each man unto his neighbor: 'Is not this that which Moses did then declare unto us in prophecies.'" An unidentified "one who is over them," will intercede with God on behalf of the people, and God will then allow them to return to their homeland. Then "the two tribes shall continue in their prescribed faith... and the ten tribes shall increase and multiply among the Gentiles." 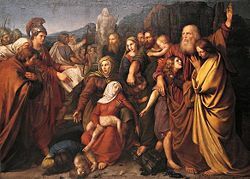 Maccabees persecuted by the Greeks: The Maccabees were originally greeted as heroes by pious Jews, but their descendants, the Hasmoneans, were seen as corrupted by luxury and too amenable to Roman cultural influence. Despite these blessings, the people will become "divided as to the truth." Unauthorized priests will minister at the Temple altar, and many will take bribes and pervert justice. Kings will begin to rule (the Hasmoneans) under whom the priests will "work iniquity in the holy of holies." Following this, an even worse king will arise (Herod the Great), "a man bold and shameless," who will harshly punish these priests, but will also rule the entire land through fear for 34 years. His sons will succeed him. "Destructive and impious men shall rule, saying that they are just... treacherous men, self-pleasers, dissemblers in all their own affairs and lovers of banquets at every hour of the day, gluttons, gourmands, devourers of the goods of the poor." Because of the sins of these rulers, God will again pour his wrath down on the nation, raising up "the king of the kings of the earth," who will carry out a brutal persecution against the Jews. Jewish boys will be forced to undergo painful operations to reverse their circumcisions, and parents who refuse to comply will be crucified. Pious men will be forced by torture to blaspheme God. And He shall forthwith avenge them of their enemies. Moses commands Joshua to preserve these words of prophecy, urging him to "be strong and of good courage" in his ministry. Hearing of Moses' impending death, Joshua tears his clothes in mourning, but receives words of comfort from the old prophet. Unfortunately, the text breaks off before its conclusion, and the death and supposed assumption of Moses is not described. Christian portrayal of the assumption of Moses. As the time for Moses' death approached, God permitted him to ascend into heaven, and unveiled to him the future world. God's Attribute of Mercy came to him, saying: "I will announce good tidings." Turning his eyes to the mercy seat, Moses saw God building the Temple of Jerusalem out of precious stones and pearls. He also saw the rays of the Godhead and the Messiah, the son of David, with the Torah in his arms. Moses also beheld the spirit of his own brother Aaron in his priestly robes. Aaron informed Moses that his death was near at hand. Moses then asked God for permission to speak with the Messiah, who revealed to him that the sanctuary and city which God was then constructing in heaven would one day be established for Israel and endure for all eternity. Moreover, the Messiah said, God had shown the same vision to Jacob in his famous dream in Bethel. Moses asked when the new Jerusalem would descend to earth, and God replied: "I have not yet revealed the end to anyone; should I reveal it to you?" At this, Moses bargained: "Give me at least a hint from the events of history." God answered: "After I have scattered Israel among all the nations, I will stretch out my hand to gather them in a second time, from all the ends of the earth." Moses then joyfully departed from heaven, followed by the angel of death, who demanded his soul. Moses refused to yield it. Finally God appeared to him, and he surrendered his soul to God willingly and cheerfully. ↑ Apocalyptic Literature jewishencyclopedia.com. Retrieved September 1, 2008. This article incorporates text from the 1906 Jewish Encyclopedia, a work in the public domain. All links retrieved April 21, 2016. History of "Assumption of Moses"
This page was last modified on 21 April 2016, at 15:58.